Nearly $200,000 worth of cash investments and professional services was awarded to UNB student group, Total Pave, at last night's NBIF Breakthru competition. UNB's entrepreneurial strengths were well on display at this year's event with four of the five finalists being UNB groups. More than $400,000 in cash and services were handed out. Runners up were StoreIt Squirrel and UNB student group, Black Magic. But it was Total Pave who walked away with the grand prize and bragging rights of being the 2013 Breakthru winner. Civil engineering student Coady Cameron and MBA student Drew Cameron are the masterminds behind the company. Total Pave is a smartphone app that allows engineers to acquire and wirelessly report the Pavement Conditions Index and International Roughness Index. Its price, speed and updatability will save governments thousands of dollars. This technology was born from UNB’s Dr. Trevor Hanson’s Introduction to Pavement Management undergraduate course, and is now being further developed by Coady as part of his master's in civil engineering which is being co-supervised by Dr. Hanson and Dr. Eric Hildebrand, professor, of the UNB Transportation Group. There are many people who work behind the scenes to provide UNB students with every opportunity to get their ideas heard and their businesses and products launched, including the faculty of business administration's International Business and Entrepreneurship Centre, the faculty of engineering's Technology Management and Entrepreneurship Centre, the Pond Deshpande Centre and the Office of Research Services. Congratulations to all UNB's teams who were finalists in this year's Breakthru competition: Total Pave, RTV Group, Cetex, and Black magic. 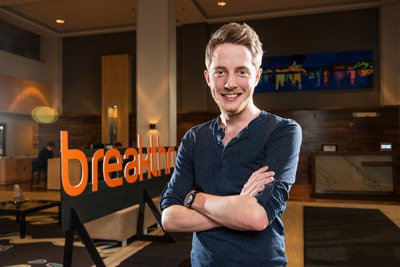 Breakthru is a bi-annual business plan competition that seeks to start up three new growth companies in New Brunswick and is hosted by NBIF and Cox & Palmer.